This article was originally published in French on this website on 10 February. The exact nature of the players who triggered the revolt on the 25 January, the date of the first call to go out on the streets, is not yet entirely known. But two things are clear. 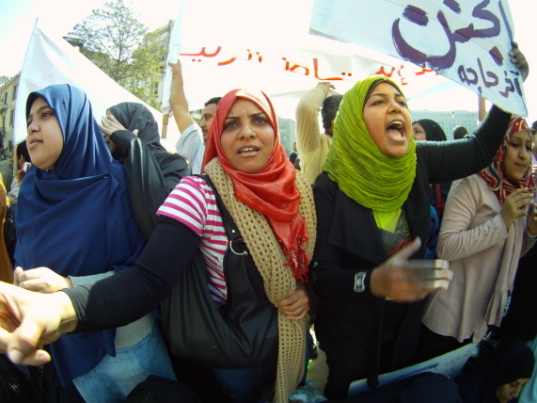 The first demonstrations in Tahrir Square were led by young people from different protest movements who have structured Egyptian politics over the last two years: protest movements with no clear ideological orientation, a mixture of democratic aspirations, nationalist references and a leaning to the left. It is also clear that the Muslim Brothers, like the other political forces, were not present at the start of the uprising. The religious establishment, like all the political actors, was forced to respond to the uprising as it unfolded. Positions were varied, but no religious actor stood as guarantor of the “revolution”, and most were distrustful of it. Therefore an Iranian-type scenario is unlikely: religious leaders and the street have not yet reached a moment of communion. The Salafist movement condemned the protests; the Muslim Brothers first retreated, then got sucked in by the dynamism of the dispute, then tried to open up a negotiation process which the demonstrators, bolder in their demands, didn’t want. Though that was not necessarily the position of all Egyptians, many of whom would have settled for a compromise, with Mubarak running the transition and the demand for democracy postponed until the next elections: the voice of the street isn’t necessarily the will of the people. The Islamist groups were without doubt the most detached. Among these, various parts of the Salafist movement condemned the demonstrators very clearly from the time of the first appeals. The official religious institutions, both Muslim (al-Azhar and Dar al-Fatwa) and Christian (the Coptic Church), had ties of allegiance to the regime, and were even further from grasping the new revolutionary spirit. The grand sheikh of al-Azhar, Ahmed al-Tayyeb, first supported the regime, then with some difficulty changed course, talking of the demands of the uprising in words that were less aligned to the regime, but extremely late. At the height of the dispute, in early February, the sheikh of al-Azhar called for calm and condemned the deaths of Egyptians – but without saying clearly that the deaths had been part of the confrontation between a regime which had resorted to violence through its usual outlets (the civilian police, the party-state) and young thugs from the poor parts of town. Pope Shenouda, for his part, called on the Christian population throughout the uprising not to join the protests. The political dependence of the leadership of the clerical institutions – both Christian (the Coptic Church) and Muslim (al-Azhar) – was very badly received by the people, and risked jeopardising their relations with their bases over the long term. This was seen in the anger of young Copts in Tahrir Square at the position taken by Pope Shenouda; the resignation of al-Azhar’s vice-spokesman, Mohamed Rifai al-Tahtawi (who then joined the demonstrators on the streets); and the number of al-Azhar preachers and imams who joined the protest movement, wearing their official clothes. The huge numbers who abandoned the official mosques on the Fridays to join the demonstrators showed the crisis of communication between religious establishment and people. Fatwas calling for calm went disregarded. On the Coptic side, many joined the protests, too. Their praying side by side with Muslims in the streets showed a double rejection: a rejection of the regime, but also of the Church’s political support for a regime which many Copts feel has done nothing for them; they complain it has been responsible both for growing Islamisation and separation of identities along confessional lines. Strangely, it was the person everyone had thought to be the least inclined to get involved in politics, Amr Khaled, the cool young preacher and religious conscience of the Muslim middle classes, who supported the protest movement the most openly. He supported the uprising from the start, issuing clear political demands (notably, the revision of the constitution), called on activists from his network of development initiatives to support the protest, and promised to send “50,000 young people into the streets to protect public institutions” – a clear position of support. Amr Khaled also went to Tahrir Square several times, and called on the regime to “listen to the demands of the young.” If the preacher had seen politicization as part of a long-term process, it was clearly accelerated and clarified by the protests. The Salafist nebula of groups found itself deeply at odds with the dynamic of the street. From the start, and up to now, its position has been unequivocal: the protest movement must be boycotted because protest means chaos. Better to choose the iniquity of the regime than the void which opposing it might open up (the Salafists base themselves on a fatwa by the medieval Islamic thinker Ibn Taimiyya, affirming that 70 years of iniquitous rule are worth more that one day without rule). The influential Salafist sheikhs in Egypt, especially those who have established strong positions of influence through the religious satellite television channels (al-Nas, al-Rahma etc), have, however, slightly scaled down their overall objection. As the movement grew, they stopped opposing it and tried to contain it, making do with reminders of the importance of protecting public goods and underlining the need to oppose thugs and gangs. Their theology of political submission – present through the influence of the Saudi sheikhs Rabia al-Madkhali and Mohamed Aman al-Jami – obviously had the blessing of the authorities, even though its radical nature, especially its rejection of the Coptic population, had caused a severe hardening of positions on the confessional front. In 2010, with this worsening of confessional relations (see the excellent report by the Egyptian Initiative for Personal Rights), the Mubarak regime decided to suppress religious channels dominated by Salafist sheikhs in the interests of social peace. But these same clerics have re-established themselves, not by restoring the banned satellite channels, but by appearing on the official Egyptian channels: sheikhs such as Mohamed Hassan, Mahmoud al-Masri and Moustapha al-Adawi endlessly churned out their condemnation of the protests, and reminded viewers of the benefits of social peace. Some went so far as to call the revolt a “Zionist plot”. Their position is aligned, to the letter, with that of the official Wahhabism of the clerics in Saudi Arabia, whose mufti had declared, in similar vein, that all protest movements in the Arab world are western machinations against the Muslim community. Sheiks from this Salafist trend maintained their unchanging line. One of them, Sheikh Mahmoud Amer, declared the candidates who stood against Mubarak in the 2005 presidential elections to be illicit, religiously speaking, since they considered Mubarak the religious guarantor of the legitimate authority of the community’s affairs. When Mohamed al-Baradai said he would stand in the presidential elections, Sheikh Amer declared that his blood was “licit” (an indirect call for his murder) on the grounds that he was “inciting civil insurrection against the Mubarak regime” (Al-Ahram Hebdo, no 850, 2-28 December 2010). If the position of the loyalist wing of Saudi Wahhabism was foreseeable, that of the Salafist sheiks of the Alexandria school was awaited with some curiosity. For this school has developed a far more autonomous line vis-a-vis the regime than that of the preachers ideologically aligned to the official Saudi clerics. Indeed, the Salafist school of Alexandria now finds itself in a position critical of the regime. And it has been subject to pressure from the security services and a wave of arrests, culminating unsurprisingly after the Alexandria attack of 31 December 2010 with the imprisonment of hundreds of their movement and the death under torture of one of their members, Sayed Bilal. Yet in spite of this, the leaders of the Salafist school of Alexandria, and their followers in over 10 Egyptian governorates, refused to support the insurrection, even less join it. Furthermore, they went along with the campaign of intimidation, emphasizing the risk of chaos, and in their mosques, they spoke of the threat of the protest movement to “Islamic identity”. On the site SalafVoice (in Arabic), its most prominent sheikh, Yasser Burhami, pronounced a fatwa affirming the illicit nature of the demonstrations. Height of the political abdication of the Salafist movement: some Salafist mosques simply stayed closed during the second Friday of the demonstrations, the famous “Day of Departure” (yaum al-rahil). Less clear than the school of Alexandria or the various Salafist sheikhs following the loyalist Saudi line were the group of former jihadists. Over the past years, they have made a series of ideological revisions leading to a theological position rejecting the resort to violence. During the uprising the group remained mostly very reserved. There was one communiqué from two of their mentors, Tariq and Abbud al-Zummur, supporting the mobilization; but most of the former jihadists leaned towards calm and an end to the political standoff, in the belief that people could, after all, be satisfied with Mubarak’s promise not to stand in the next elections planned for the autumn. They were thus seeking to position themselves within the framework of a national dialogue, a stance interpreted by some experts as a strategy to dilute the demand for change through potentially contradictory agendas and demands. There was one single discordant note in this loyalist Salafist concert: the position of the “reformist Salafist” current, which emanated from Saudi Arabia as part of an attempt to fuse Wahhabite conservatism with Muslim Brother activism. This trend, though very small in Egypt, has a presence through personalities such as Gamal Sultan, and the project of a political party, the “reform party”. From the start, it has unambiguously supported the movement for democratic reform. The Muslim Brothers’ position evolved under pressure from the street (and not the reverse). At the start, with the first demonstration on 25 January, the Brothers joined in but only in a symbolic way, sending some very restrained groups from their youth movement. Then, with the “Day of Rage” on 28 January, the Brothers concentrated their efforts on Cairo and mobilized about 100,000 people, according to one of their cadres. 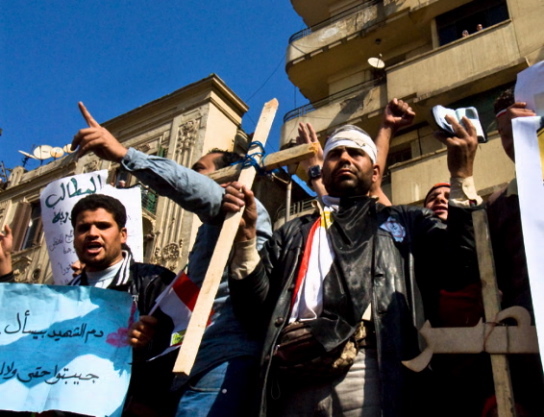 The Brothers in Tahrir Square, truly mobilized and strongly influenced by the other groups who started the protest movement, continued to call for Mubarak’s departure ahead of any negotiation. But on 5 February, their leadership began talks with then vice president Omar Suleiman, former head of Egyptian intelligence. According to a close observer, the Brotherhood’s leadership thought it could not pass up such a chance of winning some sort of recognition, even a legitimate presence. This exasperated the young Brothers out on the streets. Unlike other Islamist movements, which have clarified the structural dilemma of Islamism (as a movement of preaching or of political participation), the Muslim Brothers are based on the concept of shumuliyya, globalism: this makes them not just a political organisation, but one which is also religious, social and economic. And this confusion between politics and religion is out of place in an insurrection whose spirit is above all political. The two anecdotes are telling: the revolution has a political logic – and its culture is equally political. It is not religious (which doesn’t of course mean that the post-authoritarian political equation, if it happens, would not give the religious their due). But this political culture is not that of the Brothers, who tend to confuse religious normativity and political demands, and to sacrifice the demands of the people – and the political forces that represent them – to narrower interests. The Muslim Brothers did not lead the revolution; and they definitely do not appear as the guardians of its “spirit”. Though its concept may be floating, between Tunis and Cairo we are clearly seeing a revolutionary spirit take shape which could hardly be further from the political culture of the Brothers: it is not programmatic; it does not prefer one ideology over another but demands a transparent framework for political competition; it is anti-authoritarianism; it is democratic and not religious; it functions in a loose logic of networks, spirit of Facebook, transparency (the reverse of a pyramid structure, of secrecy and submission). It bypasses the existing political players in their entirety, including the Muslim Brothers, but recruits among the young of these parties and pushes them beyond their training (the Facebook experience has given birth to a movement, modest but real, of self-criticism and demobilisation of young people who have rejoined a network of existing mobilisations). Revealing, as so much else at Tahrir Square, was the enthusiasm of one young militant working for an Islamist site who rejoiced because the first demos had been led by secular Christians in disagreement with their own Church. The young Brothers, especially on Tahrir Square, are now rallying to the militant spirit which is coming from the new network initiatives which were at the heart of the uprising and which the Brothers had difficulty in catching up with: the Khaled Said group, the young mobilised around Amr Khaled, the “control group” (an electoral monitoring group set up by young Brothers during the 2010 elections which kept going and which monitored police management of the uprising) – groups which owe little to the mobilisation of the parties, and even less to their spirit. Through all this, the dynamic of opposition is showing the exhaustion of the authoritarian models of the regimes in place, but also the exhaustion of the traditional forms of opposition to them. What is happening in Egypt is not just the contesting of a regime, but the calling into question of a political culture.